Thom Hartmann, one of the Progressive Media’s smartest guys has written countless dissertations on this. One I’ve found very helpful explaining is How Reaganomics Has Bamboozled the Poor. He shows point by point why tax cuts on the super rich SIMPLY DON’T WORK. Proof the Republicans want to place the burden on the backs of poor people by cutting programs, eliminating earned income credit, slashing Medicare & Social Security, can be found in the Ryan Budget, a soulless, heartless and gutless document that gives loopholes & subsidies to the über rich while taking food out of poor families’ mouths. 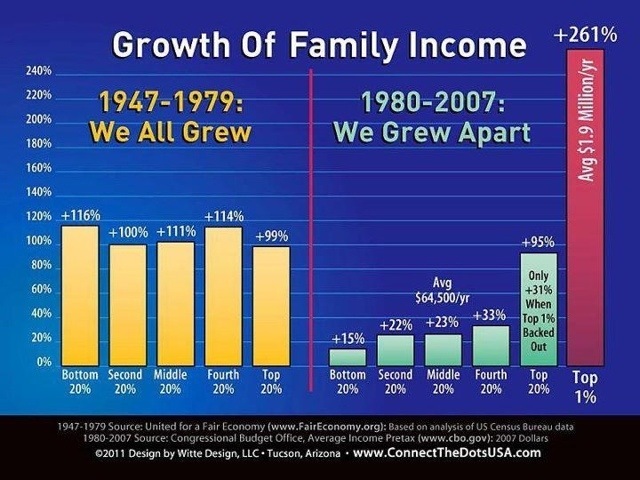 Here is the startling evidence why this Reaganomics garbage only benefits the 1%.